Cesc Fabregas' first league goal in 11 months proved the difference as Arsenal stole a march on 10-man Bolton in the race for a Champions League place. The Gunners, looking for a first win in five games, went behind on 10 minutes to Nicolas Anelka's close-range volley. But Arsenal slowly began to dominate and Tomas Rosicky poked in to level. Fabregas' 12-yard curler completed the comeback and Arsenal saw off a late Bolton rally to seal the win after Ivan Campo had gone for a second booking. Bolton have been touted as the Gunners' bogey side in recent years, but the Trotters have not won at Arsenal in the league for 45 years. And Sam Allardyce's side rarely looked like ending that run at the Emirates, despite taking the lead. Former Gunner Anelka grabbed the opener, volleying in from close range after Kevin Nolan's looped header had been parried, with William Gallas fortunate his attempted punch off the line was ignored by referee Rob Styles. However, Arsenal are well versed in battling back from a goal down at home - this was the 10th time they had conceded the opening goal in the league at the Emirates - and it was not long before their passing game clicked into gear. Emmanuel Adebayor should have levelled within minutes of Anelka's goal when his slipped effort was saved by the feet of Jussi Jaaskelainen, while Freddie Ljungberg curled narrowly over with a 20-yard free-kick. Kolo Toure also brought the best out of Jaaskelainen from range but, with the Gunners continuing to misfire in front of goal, Bolton could have scored themselves - Gallas doing well to deny Nolan from close range. The Gunners finally made the breakthrough on the half-hour, though, Rosicky poking in after Nicky Hunt's slip in the six-yard box. It was only Arsenal's second goal in their last five games, but a blistering start to the second half bore further fruit as Fabregas netted what turned out to be the winner. The Spaniard latched onto Gilberto Silva's through-ball, before twisting and turning in the box and then curling into the corner from 12 yards out. Suddenly the Gunners were rampant, with their pass-and-move game causing Bolton all sorts of problems, and Alexander Hleb should have extended the lead when he poked wide from 16 yards. While just one goal remained the difference between the sides, though, the visitors always felt like they had a chance and when substitute Abou Diaby headed Adebayor's cross wide from six yards out, Bolton might have thought they had a chance. But, despite Anelka's liveliness up front, the Trotters were struggling to trouble the home defence and after Campo was sent off with 10 minutes to go for a second booking, their hopes faded. Diaby wasted another glorious chance to seal it in the dying minutes when he strolled through but shot straight at Jaaskelainen. And there was drama when the ball bounced up onto Emmanuel Eboue's arm in the Arsenal box - prompting frantic appeals from Bolton for a penalty - but they were waved away as the Gunners sealed a deserved win to move five points clear of the Trotters. "I don't think fourth place is secure for us yet but this is another step forward after a very good performance. "Once again we had to come from behind, but we played very well, created chances and the only regret is that we didn't finish them off sooner. "Finishing in the top four is always our minimal target but sometimes, to improve, a young team needs to flirt with difficult periods so that you can come back stronger and I have been deeply impressed by our mentality." "It's hugely disappointing for us after such a very good start - that's the first time this season that we've gone in front and lost. "But I think two big decisions went against us as well. Ivan Campo's first booking was unwarranted, even though the second was fair, and we think that Eboue's handball at the end was a stone-waller. "We've also conceded two poor goals from our point of view so, all in all, it's disappointing. "However, if we can finish fifth I would regard that as a fantastic achievement." 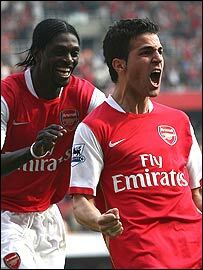 Arsenal: Lehmann, Eboue, Toure, Gallas, Clichy, Hleb (Julio Baptista 81), Fabregas, Silva, Rosicky, Ljungberg (Diaby 60), Adebayor. Subs Not Used: Almunia, Senderos, Aliadiere. Goals: Rosicky 31, Fabregas 46. Bolton: Jaaskelainen, Hunt, Meite, Faye, Gardner (Teymourian 56), Nolan (Thompson 76), Campo, Speed, Davies, Anelka, Diouf (Vaz Te 61). Subs Not Used: Al Habsi, Giannakopoulos.